For a Christian sickness and death can and should be a means to seek holiness and to redeem with Christ. This is the purpose of the sacrament of the Anointing of the Sick. In the Ritual for the Anointing of the Sick, the meaning of human suffering and death is explained in the light of God's salvific plan, and more specifically in the light of the salvific value of the sufferings undergone by Christ, the Incarnate Word, in the mystery of his passion, death and resurrection. As the Catechism of the Catholic Church teaches: “By his passion and death on the cross Christ has given a new meaning to suffering: it can henceforth configure us to him and unite us with his redemptive Passion" (CCC , 1505). “Christ invites his disciples to follow him by taking up their cross in their turn (cf. Mt 10:38). By following him they acquire a new outlook on illness and the sick" (CCC, 1506). As the Catechism of the Catholic Church says: “It is very fitting to celebrate [the Anointing of the Sick] within the Eucharist, the memorial of the Lord's Passover. If circumstances suggest it, the celebration of the sacrament can be preceded by the sacrament of Penance and followed by the sacrament of the Eucharist. As the sacrament of Christ's Passover the Eucharist should always be the last sacrament of the earthly journey, the 'viaticum' for 'passing over' to eternal life" (CCC, 1517). The minister of this sacrament must be a priest or bishop. Pastors have the duty to instruct the faithful about the benefits of this sacrament. The faithful (particularly family members and friends) should encourage sick people to call for the priest so that they can receive the Anointing of the Sick (cf. CCC, 1516). The faithful should keep in mind the tendency today to “isolate" those who are sick and dying. In hospitals and clinics people often die 'alone' even though they may be surrounded by others in an intensive care unit. Everyone—especially Christians who work in hospitals and hospices—should strive to ensure that seriously ill people receive every possible assistance to relieve their suffering in body and soul. And an important means (besides the sacrament of Penance and Viaticum) is the sacrament of the Anointing of the Sick. The Anointing of the Sick is meant for all those who have been baptized, have reached the age of reason and are in danger of death from serious illness or from old age as they become increasingly frail. It cannot be administered to someone after death. The subject must have at least the habitual and implicit intention to receive the sacrament. In other words, the sick person must have the desire (never having expressed otherwise) to die a good Christian death, with the supernatural help that this entails. Even though the Anointing of the Sick can be administered to those already unconscious, every effort should be made to administer it while they are still conscious, so that they can better prepare to receive the grace of the sacrament. It should not be given to those who remain obstinately impenitent in public mortal sin (Code of Canon Law , canon 1007). If someone who has been anointed recovers from their illness they can be anointed again in the case of a new serious illness, and the sacrament can also be repeated during the same illness if the person's situation again deteriorates (cf. Code of Canon Law , canon, 1004, 2). Finally, the Church sets down that “if there is any doubt as to whether the sick person has reached the age of reason, or is dangerously ill, or is dead, this sacrament is to be administered" (Code of Canon Law, canon 1005). The reception of this sacrament is not essential in the sense of being necessary for salvation, but neither should it be voluntarily disregarded if it is possible to receive it, for that would amount to refusing a help of great value for salvation. To deny this help to a seriously ill person could amount to a serious sin. —preparation for the passage to eternal life. As the Catechism of the Catholic Church teaches: “This grace is a gift of the Holy Spirit, who renews trust and faith in God and strengthens against the temptations of the evil one, the temptation to discouragement and anguish in the face of death (cf. Heb 2:15)" ( CCC , 1520). Cf, DZ 216; 1324-1325; 1695-1696; 1716-1717 ; CCC, 1511-1513 . Cf. Ritual for the Anointing of the Sick, Introduction , 1-2. Cf. Deut 28:15 ; Deut 28:21-22 ; Deut. 28:27 ; Ps 37 (38): 2-12 ; Ps 38 (39): 9-12 ; Ps 106 (107): 17 ; Wis 2:24 ; Rom 5:12 ; Rom 5:14-15. “Christ not only allows himself to be touched by the sick, but he makes their miseries his own: 'He took our infirmities and bore our diseases ( Mt 8:17 , cf. Is 53:4) … On the cross Christ took upon himself the whole weight of evil (cf. Is 53:4-5) and took away the 'sin of the world' ( Jn 1:29), of which illness is only a consequence" ( CCC , 1505). Of itself suffering does not save or redeem. Only illness accepted with faith, hope and love for God, in union with Christ, purifies and redeems. It is Christ who saves us, not through suffering but by suffering transformed into prayer as a 'spiritual sacrifice' ( Rom 12:1; 1 Pet . 2:4-5), which we can offer to God, uniting ourselves to Christ's Redemptive Sacrifice, made present in each celebration of the Eucharist so that we can share in it. In addition it is good to bear in mind that “it is part of God's providential plan that we fight ardently against any infirmity and diligently seek health, so that we may continue fulfilling our roles in society and the Church, as long as we are always ready to complete what is lacking in Christ's Passion for the salvation of the world, hoping for the glorious freedom of the children of God (cf. Col 1:24 ; Rom 8:19-21)" ( Ritual for the Anointing of the Sick, Introduction , 3). St Josemaria, Christ is Passing By , 80. Ritual for the Anointing the Sick, Introduction , no 20; Vatican.II, Const. Sacrosanctum Concilium , 73; Paul VI, Apost. Const. Unctionem infirmorum , 30 November 1972; AAS, 65, (1973) 8. The Introduction to the Ritual for the Anointing of the Sick (no. 21) notes that in accord with canon 999 of the Code of Canon Law, in case of necessity any priest can bless the oils for the Anointing of the Sick, but this has to be within the celebration of the sacrament. According to the same document (no. 23), in case of necessity it is sufficient to anoint just the forehead or another convenient part of the body. Ritual for the Anointing of the Sick, Introduction. 25; cf. Code of Canon Law, canon 847,1; CCC , 1513. The first part of this formula is said while anointing the forehead and the second part while anointing the hands. In case of need, when only one anointing can be done, the minister pronounces the entire formula during this one anointing. Cf. Code of Canon Law , canon 1003, 1. Neither deacons nor the lay faithful can validly administer the Anointing of the Sick. (Congregation for the Doctrine of the Faith. Note on the minister of the sacrament of the Anointing of the Sick , “Notitiae" 41 (2005) 479). Cf. Vatican II, Const. Sacrosanctum Concilium , 73; Code of Canon Law, canons 1004-1007; CCC , 1514. Hence Anointing of the Sick is not destined for those of the faithful who have simply reached 'old age' (it is not a sacrament for retired people), nor it is solely a sacrament for the dying. In the case of a surgical operation, the Anointing of the Sick can be given when the illness itself that is the reason for the operation places the patient in danger of death. Cf. Vatican II, Const. Sacrosantum Concilium , 74. 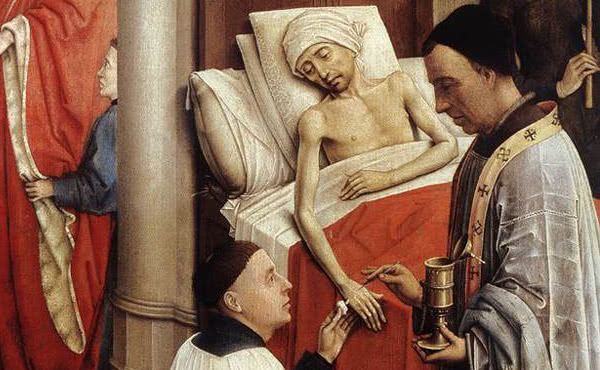 The Code of Canon Law states: “This sacrament is to be administered to the sick who, when they were in possession of their faculties, at least implicitly asked for it" (canon 1006).